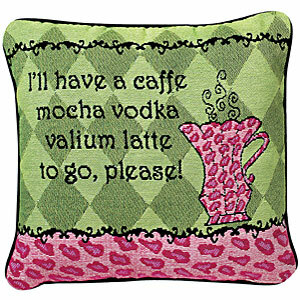 Caffe mocha vodka valium latte to go please! And IT’S A PILLOW! How perfect is that?! As you may have already considered, I don’t’ “get out” much. I mean I don’t want to sound whiny, I do leave the house at least twice a week and sometimes more, (sometimes less). But shopping for Christmas is always a real challenge. I lurves me some catalogs! This particular one is called Potpourri. This particular item is on page 28. Isn’t it adorable? I bet you know several people who would love it. Oh, it’s item #R86-065. Anyway, I just wanted to share, plus, I may be short on posts this month due to the effort to post EVERY SINGLE DAY, so when I find something I think is neato, you may be subjected to it. Yeah. That would be my disclaimer. More later? Only if it’s mentionable. If you like that, try Femail Creations. That’s exactly what I needed today–I feel like I’m about to hibernate for the winter. I don’t want to leave my house until spring! That latte would do the trick, I think! I wonder if they deliver? If you add a side of browny to that I would be very happy! Well, I know what some of my friends will be getting for Christmas this year!!! Going to their site to request a catalog now…..